Box 3: This shows the troops movement. If there are any incoming or outgoing troops currently on their way, you will be able to see them here. Keep in mind, that scouts can't be seen. They can be discovered after the scouting attempt. 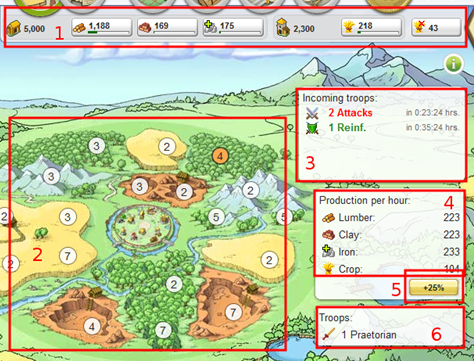 Box 6: This shows the units you currently have in your village. Since you just started and you haven't even built a rally point yet, there are none in your village. 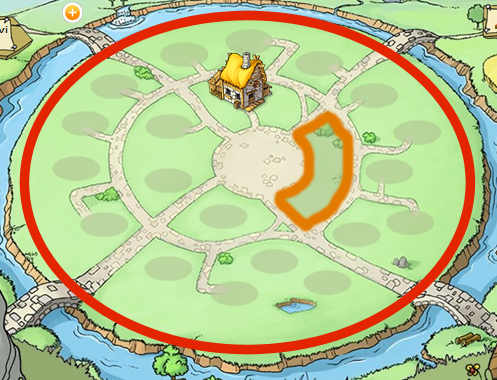 The small plus button (you can see it in the left upper corner of the picture shown above), when clicked, will show you the levels of your buildings inside the village. If you don't want them displayed, click on the minus button in its place. The red circle with the number 1 around a square the small icon in top right corner is called an unoccupied oasis. When annexed, they will give your village extra production bonus. 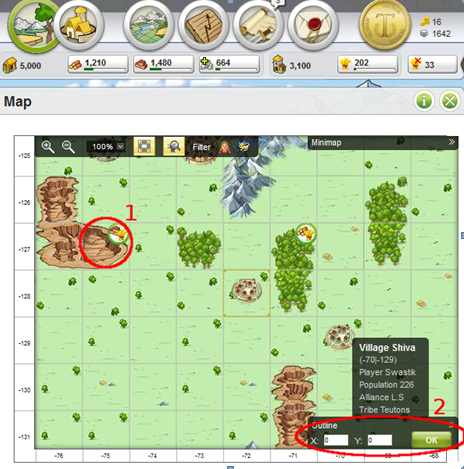 If you were to click on that small square, you would see information about it, such as how many wild animal were there and even have the option to raid the unoccupied oasis for resources. If you gain a Hero's Mansion in the future, then level the Mansion to level 10, you could claim that oasis for yourself and gain a bonus from it, but you might not be ready for that until after you have been in the game for at least a week. Any other square can be either settled and new village can be established there. Those are called abandon valleys. Also, there's wilderness. Such example is the field to the left next to the oasis. If you click on it, you will find out, that there's nothing you can do with it. Wilderness can't be converted into the village as well as it can not be raided and annexed as an oasis.